5.3 Earthquake hits central Alaska. 5.2 Earthquake hits the Celebes Sea. Tropical storm 21w (Sinlaku), located approximately 210 nm southeast of Da Nang, Vietnam, and is tracking westward at 11 knots. France – The flash flooding in France has now claimed the lives of three people and left two others missing. The fatalities are from Mediterranean towns of La Londe-les-Maures, Grimaud and Hyeres. Tornadoes in Serignan and Nissan-les-Enserune in the Herault department injured ten people. China – Another landslide in southwest China’s Yunnan Province has claimed the lives of six people. A separate landslide blocked a 110-meter-long section of railroad of the Nanning-Guangzhou Railway. Fogo (Cape Verde): Activity, after having slowed down a bit yesterday, picked up again this morning, as a new vent opened above the eruption fissure. Lava fountaining and associated lava effusion mainly occur from the lower vent, while the upper one shows strombolian explosions, strong degassing and ash emissions. As typical for flank eruptions, eruptive activity has by now concentrated to and continues from two vents (as compared to 6 active ones on the first day). Zhupanovsky (Kamchatka, Russia): A moderately strong ash emission occurred this morning. A plume at 20,000 ft (6 km) drifted east. Weaker ash venting continued afterwards. (Tokyo VAAC). Aso (Kyushu): Activity at the volcano picked up and went through an intense phase of strong, continuous ash emissions Wednesday. An ash plume rose to approx. 3 km altitude, according to Tokyo VAAC. 5.1 Earthquake hits the Panama-Colombia border region. Tropical storm 21w (Sinlaku), located approximately 537 nm east of Ho Chi Minh City, Vietnam, and is tracking west-northwestward at 15 knots. Philippines – 6,933 people have been affected and displaced by Tropical Depression Queenie (Chebi). More than 30 evacuation centres have been opened for them. Public storm warning signal 1 has been issued in Palawan, including the Calamian group of Islands, Cuyo Islands and Southern Negros, Guimaras Island, LLoiLo and Antique. 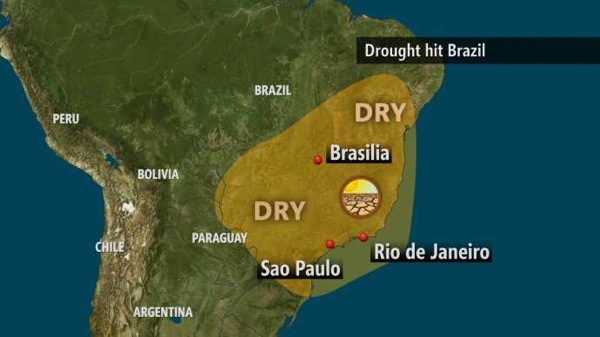 Winds of 30-60 kph are expected for at least 36 hours in these regions. Gaza – The United Nations has declared a state of emergency in the Gaza Strip after two days of heavy rains and flooding in the war-battered enclave. 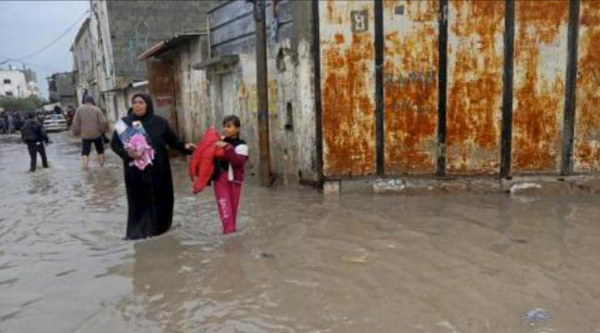 The UN Relief and Works Agency (UNRWA) declared the state of emergency in Gaza City on Thursday, after torrential rain overwhelmed some areas and caused flooding. Queensland, Australia – Brisbane residents will wake up to a huge clean-up effort this morning after the city was walloped by an extreme hail storm described by Premier Campbell Newman “the worst in a decade”. 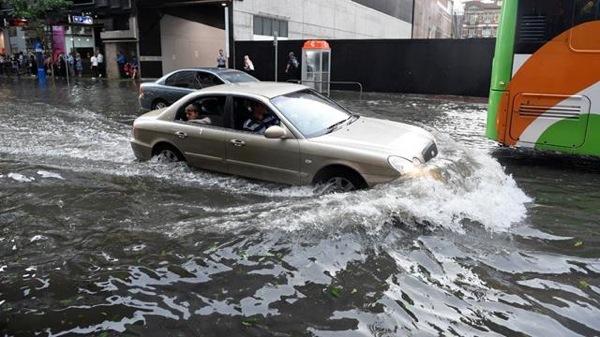 The army has been called in to help mop up after golf ball-sized hailstones catapulted by destructive winds up to 141km/h slammed into high rise buildings and vehicles in the CBD and surrounding suburbs leaving a trail of destruction yesterday afternoon. At least four light planes were flipped in severe winds at Archerfield Airport causing hundreds of thousands of dollars worth of damage. Queensland Premier Campbell Newman says all available emergency personnel have been mobilised to help with the clean-up. France – A woman has died and three other people are missing after a heavy storm triggered flash flooding in southeastern France. Decades of acid rain that have made many Canadian freshwater lakes more acidic have also profoundly altered the ecological balance and turned some lake bottoms to jelly. Even though pollution controls have long since diminished the amount of acid rain, some affected lakes have not recovered from the pollution and have become home to expanding populations of a tiny, slimy crustacean called the Holopedium. The invertebrate is surrounded by a bulbous coating of jelly. Swimmers in affected lakes often emerge from the water with the caviar-like balls clinging to their arms and backs. Writing in the journal Proceedings of the Royal Society B, researchers document that decades of acid rain have flushed away much of the calcium in the lakes, which Holopedium’s biggest competitor, the Daphnia water flea, needs to create an exoskeleton. With the formerly dominant Daphnia now deprived of enough calcium to bulk up, and gradually disappearing, Holopedium has been able to reproduce unchecked since it needs far less calcium to make its gooey shell. This competitive edge is creating a jellied mess that threatens to clog water intake systems in the lakes for residential and commercial use. 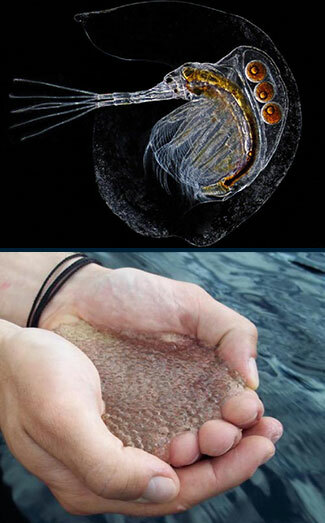 Top: Microphotograph of the Holopedium. Bottom: Researcher holds a handfull of the small invertebrates, which have slimed some Canadian lakes. Sierra Leone has appealed to the United States on Wednesday to send military aid to help it battle Ebola as it falls behind its West African neighbours Guinea and Liberia in the fight against the virus. The worst recorded Ebola outbreak has killed at least 5,689 people, the World Health Organization said on Wednesday, as the virus has overwhelmed African countries with weak infrastructure and healthcare systems. While the outbreak appears to be coming under control in Liberia, thanks partly to a health operation run by U.S. troops, infection rates have accelerated in Sierra Leone. The rate of transmission is also beginning to slow in neighbouring Guinea, the first country to report an Ebola case, although case numbers are rising in Mali. An outbreak of jaundice in Saraspur has left 199 people affected in the last three weeks. There were nine new cases on Thursday across 24 chawl clusters in the area. Ahmedabad Municipal Corporation (AMC) health officials were yet to confirm four additional jaundice cases. “The jaundice strain is hepatitis E, which is not lethal among all those who are affected,” says a senior AMC health official. The week’s hottest temperature was 113.9 degrees Fahrenheit (45.5 degrees Celsius) at Oodnadatta, South Australia. The week’s coldest temperature was minus 56.7 degrees Fahrenheit (minus 49.3 degrees Celsius) at Russia’s Siberian weather station in Agata.